Pell abused two choir boys in Melbourne’s cathedral in 1996, a jury found. He had pleaded not guilty. As Vatican treasurer, the 77-year-old Australian was widely seen as the Church’s third most powerful official. Pell is due to face sentencing hearings from Wednesday. He has lodged an appeal against his conviction. His trial was heard twice last year because a first jury failed to reach a verdict. The verdict was handed down in December, but it could not be reported until now for legal reasons. A second jury unanimously convicted him of one charge of sexually penetrating a child under 16, and four counts of committing an indecent act on a child under 16. Pell was swarmed by media and heckled by onlookers as he left a court on Tuesday. 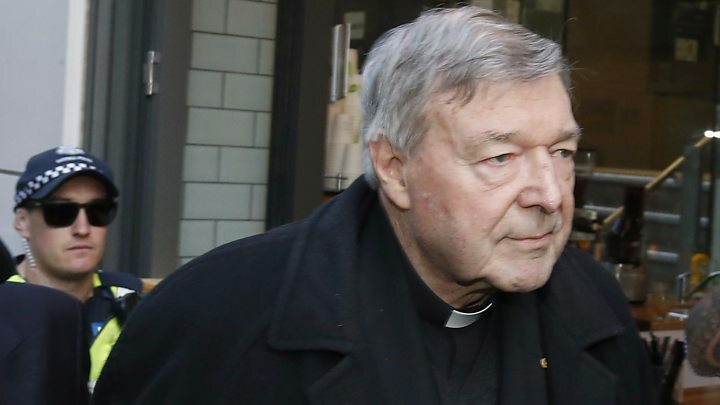 The Vatican later confirmed that Pell was prohibited from public ministry, and had been banned from having contact with minors. He has to abide by these rules until any appeal is over. They added that while the ruling was “painful”, and the Church has the “utmost respect” for the Australian authorities, Pell has the right to “defend himself until the last level” of the judicial process. Pope Francis has just held an unprecedented summit on paedophilia in the Church. 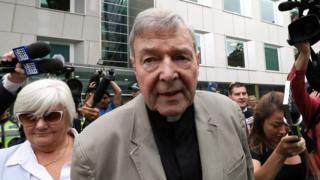 Pell was archbishop of Melbourne in 1996 when he found the two 13-year-old boys in cathedral rooms following a mass, the County Court of Victoria was told. The court heard testimony from one of the victims. The other died of a drug overdose in 2014. A jury rejected an argument by Pell’s lawyer, Robert Richter QC, that the allegations were fantasies contrived by the victims. In a statement on Tuesday, Pell’s surviving victim – who cannot be named – called the case stressful and “not over yet”. The man said he had experienced “shame, loneliness, depression and struggle” because of the abuse. “Like many survivors it has taken me years to understand the impact upon my life,” he said. The Australian Catholic Bishops Conference said the conviction had “shocked many across Australia and around the world”, reiterating its vow to make the Church “a safe place for all”. Abuse survivor groups welcomed the verdict. The Vatican said the ruling was “painful”, but added that Pell has the right to “defend himself until the last level” of the judicial process. “We reiterate the utmost respect for Australian judicial authorities,” Vatican spokesman Alessandro Gisotti said at a press conference, noting that Pell has proclaimed his innocence. “Cardinal George Pell has always maintained his innocence and continues to do so,” read a statement issued on his behalf on Tuesday. Pell would await the outcome of his appeal, the brief note read. Why was the case kept secret? Last May, a judge handed down a legal order which prevented any reporting of Pell’s trial and conviction. It was designed to prevent a separate trial – which will no longer go ahead – from being influenced by the first trial. The abandoned trial was to hear unrelated allegations – strongly denied by Pell – that he indecently assaulted boys in the 1970s. Prosecutors withdrew their case on Tuesday, citing insufficient evidence. The collapse of the second trial led to the lifting of the publication ban. The pace of justice has felt slow at times, but it has resulted in one of the Church’s most prominent figures being held to account. The Australian cleric rose in prominence as a strong supporter of traditional Catholic values, often taking conservative views, and advocating for priestly celibacy. He was summoned to Rome in 2014 to clean up the Vatican’s finances, and was often described as the Church’s third-ranked official. But his career has been dogged first by claims that he covered up child sexual abuse by priests, and then later that he was himself an abuser. Pell was demoted from the Pope’s inner circle in December. His term as Vatican treasurer expired on Sunday. Pope Francis has established a committee to tackle sexual abuses. In recent days, he has promised concrete action, calling clergy guilty of abuse “tools of Satan”.